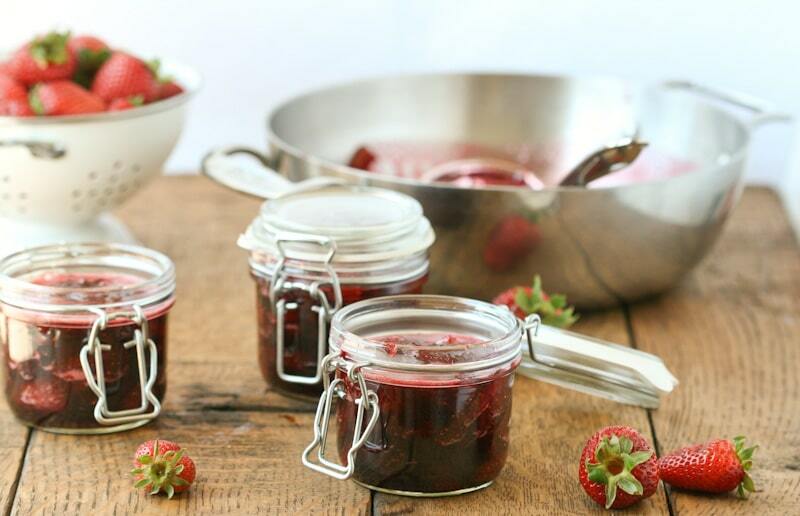 If you’ve contemplated making jam this summer, now’s the time! The berries and fruits are in their prime and with a few simple ingredients, you can make an easy honey-sweetened version of the store-bought variety. Apples contain plenty of natural pectin, so I chose to use half an apple in my jam. I cut out the white sugar and used honey to sweeten the mixture. Each year, I like to make jams or preserved fruits and bring them to the teachers during the first week of school. It’s a great way to introduce yourself and give the teacher a little something sweet as they begin a new year. So I’ll store these away for a few more weeks and hopefully make a good first impression. Making homemade jam can be a bit intimidating, but this recipe will take the fear out of the process. I took a few step-by-step photos so you can see just how simple it can be. 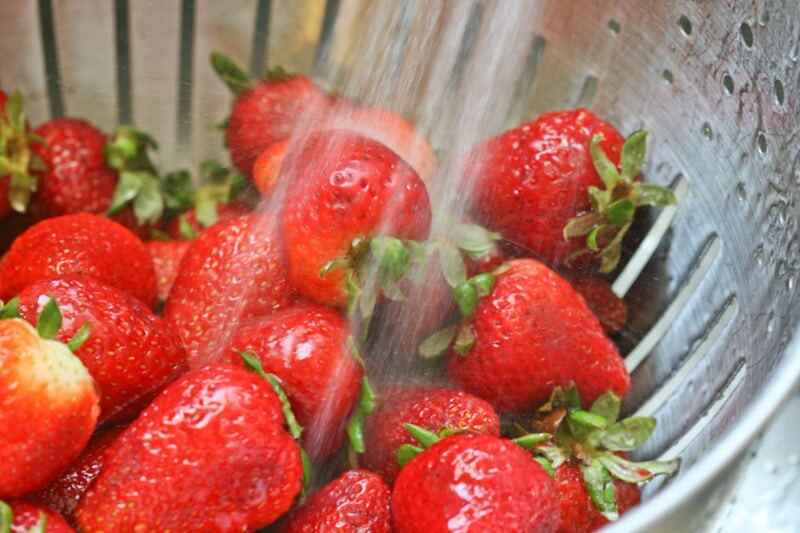 Wash the strawberries well to remove any sand or dirt. Hull the strawberries and slice. 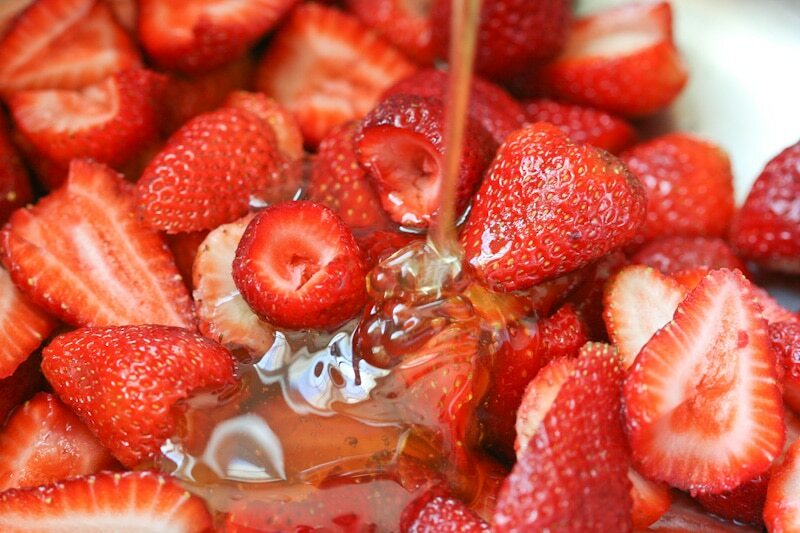 Place the strawberries in a large pot and pour the honey and Grand Marnier overtop. Turn the heat to medium to heat the berry mixture. The strawberries will slowly release their juices. 220 degrees F (Don’t speed up this process. 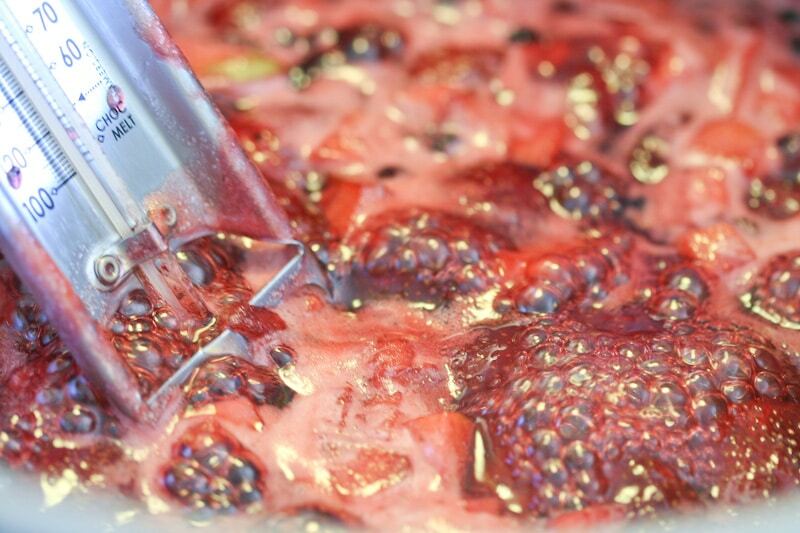 If the berries cook too quickly the mixture will not gel). Remove from the heat and let the jam cool for about 30 minutes. Spoon jam into jars and screw on the lids. Store jam in the refrigerator for up to two weeks. And lastly, if you’d like to sterilize your jars to preserve the jam then watch this video. You can substitute a portion of the strawberries with other fruits to make different combinations. I made a second batch substituting two cups of rhubarb for two cups of the strawberries and it turned out fantastic! 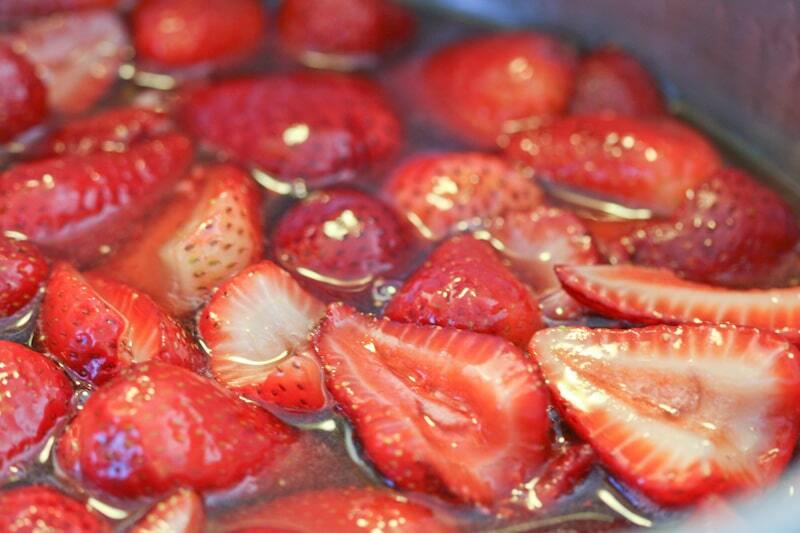 Place strawberries, honey and Grand Marnier in a large pot over medium heat. Bring to a simmer and add the apple pieces, stirring occasionally. Simmer slowly for 25 - 35 minutes until mixture reaches 220ºF (if the jam is cooked too quickly, it will not set. Make sure to cook on a very low simmer for at least 25 minutes). 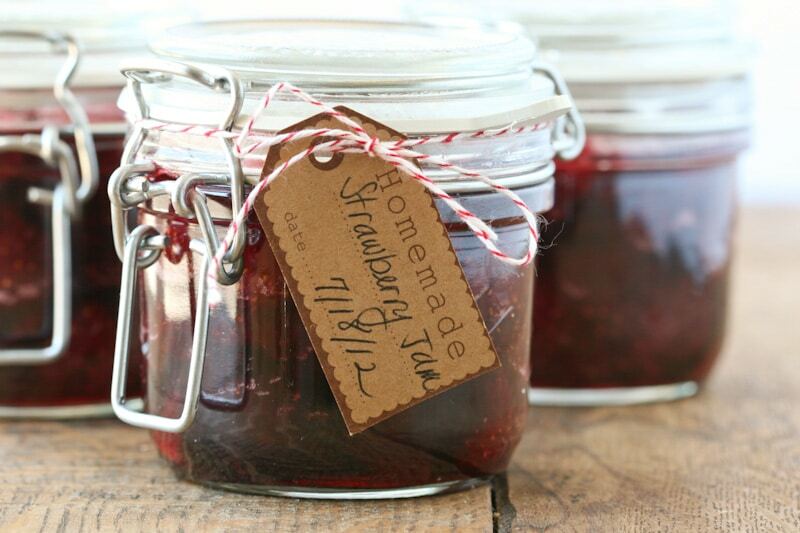 Cool jam to room temperature, spoon into jars, cover with lids, and store in the refrigerator for about 2 weeks. You can also sterilize the jars using the method in the above video to preserve the jam for future use. Awesome! I can't wait to try this! I love those jars too, where did you get them? I've seen similar jars at IKEA, but not sure if they were the same size. I love those tags...where did you get them? Love the video - I agonize how to teach readers safe canning procedures and have started linking to the Ball site but this is great! I agree. It's a tricky topic, but I thought Chow did a great job in this video. I've been using the oven method for a couple of years and love it. I'm not a huge fan of boiling water and hot jars, so this method is right up my alley! 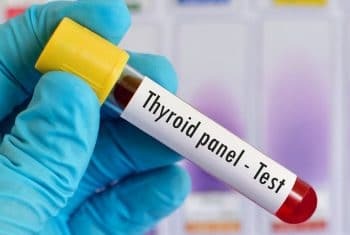 What if you wanted to store this for longer? Would you go through the regular canning process? Looks yummy! Couple of questions: 1. Can this be done with other fruits? (grapes, blueberries, raspberries, etc.) 2. Will it work to puree it really well? My daughter hates "bits and pieces" in her fruit spreads. 3. Does it freeze well to make it last longer?Thanks! 1. I know it can be used with other berries, but I'm not sure how it would work with grapes. 2. You can definitely puree the jam. 3. I haven't frozen it, but I think it would work well. Would the recipe be the same if using blueberries or raspberries or does it need to be tweaked? Any idea if the same recipe would work for peaches or do you by chance have a sugar-free recipe for peach jam? Thank you Carrie!! The recipe would be the same for blueberries and raspberries. I haven't tested it yet, but I think this recipe would work well with stone fruits too. If you give it a try with peaches, let me know how it goes! Yes, I agree, definitely for the occasional treat. :) I bought those jars at Sur La Table just a few days ago. They are currently having a sale on them too! They were each around $3.20 a piece. I've been wanting to try making jam for awhile. Thanks for the wonderful instructions...I'll have to take the plunge. I love the idea of giving it as a teacher gift. Well, I am officially craving toast with butter and jam right now, but nothing wrong with that!! Oooh, I haven't yet made jam this year, but this recipe is getting me motivated. I love that this doesn't have a ton of sweetener. Most recipes I've seen call for a lot more honey or sugar, but I find this to be a more reasonable amount. I hope the teachers like it! I would, also, love to know where the labels come from. That's quite the compliment. Thank you. I do my own photography and use the natural light. We live on an Air Force Base in the middle of the desert so we get plenty of bright light throughout the day. Over the years I've had the opportunity to learn how to better my food photography from Helene (www.tarteletteblog.com) and Diane (www.whiteonrice.com). They are both amazing photographers and teachers! 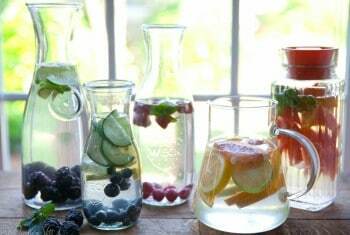 A great idea to do with with all the fresh berries we have been buying at the farmers market! I just made this and its fantastic! I cant wait to try a little of it on some homemade vanilla ice cream. Thanks for the recipe! Thanks for the feedback! I'm so glad you enjoyed it! How gorgeous! Strawberries have been over here for nearly two months (they were 4 weeks early this year) but cherries and blueberries are booming. Cherries are from the store, but I've picked bunches of blueberries. Maybe I still can work in some jam time! I've tried doing small batches with Pomona's pectin, using honey and also stevia, but the batches with Stevia were not very tasty. love the use of the apple, Carrie. I have never done that - you have inspired me. How long will the jam keep using the oven method of sterilizing? 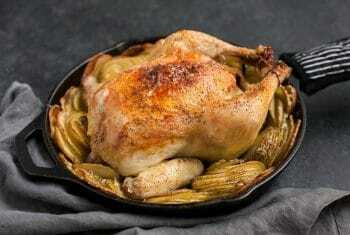 Does the traditional way mentioned in the link above provide an extended shelf life beyond what the oven method does? And lastly, will freezing work even better than either of those methods? Thanks for the delicious recipe. Germany is bursting with fresh strawbeerries, can't wait to try this! I don't have specific information about how long canned jams will last, but the site www.freshpreserving.com has lots of great info. They give extensive instructions on how to can properly. I've been wanting to do some canning of preserves and fruit with honey instead of sugar, but I keep reading that it isn't safe for long term storage that way. Does this recipe work for a hot water bath canning? I haven't read anything about honey not being a good choice for canning. If you find a source, please pass it along! Yes, this recipe will work for hot water bath canning. I hope you can offer some advice. I made this jam last night and it turned out with a great taste but a runny consistency. any ideas on what I could have done differently? Thanks! Can't wait to try this out! Just made a bunch of fig/strawberry jam( 160 jars) for our daughters wedding coming up. I do the jars the same way, I also put the seals in the oven for a few min. This helps them to seal good. My husbands grandmother used this method and you can can almost everything this way. Wow, 160 jars! How fun! We have always made freezer jam in the past - but looking to cut down on sugar. Do you know if this would work well for freezer jam? And the apple, is that used in place of the sure jel (that's what we've used in the past, but again, looking for better ingredient options). Thanks for your help! I've never tried this recipe as freezer jam. I think sure jel would work well as a substitute for the apple peel. Hope that helps! I'm deathly allergic to oranges - is the Grand Marnier/orange there for a chemistry reason, or just for flavor? Would lemon work just as well? It's just for flavor. You could use lemon juice as a substitute. May be a silly question but do you cut the strawberries them measure or measure them prior to cutting. I have two flats of strawberries to put up today and was hoping to use this recipe. I sliced them before measuring. I hope you enjoy it! It says to keep in the freg for up to 2 weeks....Is there a way to preserve them longer? If you open a jar a week after making it, does that mean it will only be good for another week? thanks :) Can't wait to make this recipe! If you follow the method described in the video and create an airtight seal, then the jam should last quite a long time in the pantry. Making this right now... So excited! PS... I tweaked it just a bit and am doing half-strawberries, half-apricots... If it tastes like my kitchen smells right now, it's going to be a treat! THANK-YOU! Carrie, Can I use frozen strawberry to make this jam? Thanks. 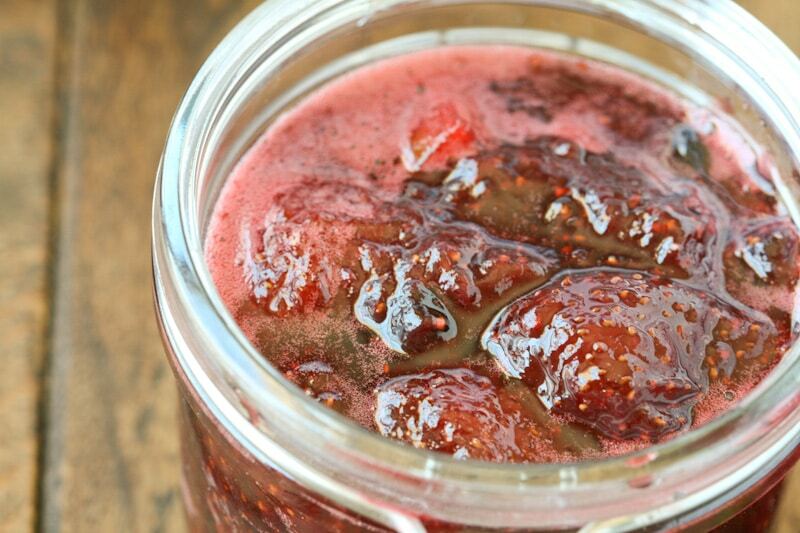 I use organic frozen strawberries for this and other jams all the time. Never have had a problem in 10 years of jamming. 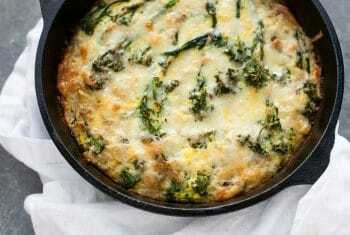 Great recipe and SO easy! Thanks for sharing! My jam turned out absolutely delicious! It will thicken as it cools. You're doing it right by letting it come to 220 very slowly. :) In this recipe, since we are using apples, there isn't a need to skim the foam off. I have a bunch of peaches that I would like to use for making jam. Would there be any modifications or changes that you recommend? I haven't made this jam with peaches, but I think a 1:1 substitution should work just fine. Hi I just love the recipe and the jars fantastic! i just wanted to know if i use this recipe and sterilize my jars the canning way which is just the water and steam process can i still use this recipe or will it spoil?? how long does it last for?? just made this with my freshly picked organic strawberries, followed it to the T but it did not set up... have it stored in fridge , I'll see what happens tomorrow. It will still be a liquid when it's hot, but sets up when it's completely chilled. I'm son sad right now. The jam did not set and now I have strawberry sauce. Not sure if it was because I tried to double the recipe. Still tastes great, though! Hmmm...did you make any substitutions? Also, it's very important that the jam is slowly simmered up to 220 degrees for at least 25 minutes or the jam won't set. Was the process possibly sped up a bit? No substitutions. It took way longer...like 45 min to reach 220. I'm going to give it another try when blueberries come in season. My kiddos and I are going blueberry picking tomorrow and I am hoping to try out this recipe; however, no one in my family is a big fan of the flavor of honey. Could I substitute maple syrup instead? Or part maple syrup/part honey? Sorry for the late reply. I was on vacation last week and took some time off. :) I haven't tried it with maple syrup, but it should work just fine. I like the idea of substituting honey with sugar and apple for pectin. Can this be made in large batches as well? And what is the purpose of the orange juice? Is it to keep the jam from turning dark in color? I yearly make about 60+ quarts and was looking into making a healthier jam. Thanks for sharing! I haven't made it in large batches, so I can't say for sure. The orange juice keeps the berries from turing color. Hi, I just finished making your recipe. I had to puree the the jam, as I don't want chunks of apples in the jam. I'm concerned that it may not set. How long does it need to cool before I know if the jam will not set at all?